Three years have passed since Moderat, the collaborative project between Modeselektor (Sebastian Szary and Gernot Bronsert) and Apparat (Sascha Ring), realized a new techno-pop direction with the release of their sophomore LP II. The record’s fusion of Szary and Bronsert’s synthetic sonic landscapes with Ring’s haunting vocals brought widespread acclaim from mainstream and underground audiences alike. Now the trio is back with III, which further formalizes their sound into a powerhouse combination that’s as at home on the radio as it is on a dance floor. In anticipation of their album’s release and upcoming tour, we sat down with Gernot to discuss how Moderat evolved into Szary, Bronsert and Ring. “The Reminder”, the first single from your new album, has more singing and songwriting than past Moderat songs. Could you explain this new direction? I can’t really go into detail here because it’s very complex and involved a lot of trial and error. That’s also the name of an old Apparat record: Trial & Error. We really incorporated his personality into this record. When we did the first Moderat record, we had a very clear direction because it was simply a collaboration between Modeselektor and Apparat. We tried to combine our experiences with Apparat’s world. But even back then we could feel a very unique handwriting beginning to develop. Then we took a six-year break before our second record dropped, and after that it was really hard to get back into the studio vibe. Then it just happened that we did a Szary-Gernot-Sascha record and not a Modeselektor-Apparat record. So you became a band? In the time between the first and second Moderat records, Sascha released his Apparat record Devil’s Walk, and that’s when he started to sing like never before. In the process he developed more self-esteem as a singer, and now, on the third record, it became clear that we had a new element that we could play with. The songs developed very naturally after that. How did you make those songs? Every song was developed differently. There was never a clear process. Sometimes Sascha had a vocal line and we built a track around it. Sometimes it was an idea that we had to shape, and sometimes it was the other way around. I think it’s really cool that there isn’t a structure, but that’s also very time consuming and exhausting. There are a lot of discussions and compromises. It would have been way easier if we could have just sat down, thought about the songs, and then created them afterwards. That’s what we want to do next time. Are there already plans for the next record? Will it be called IV? What did you use to create the record? We almost didn’t use synths on this one. Instead, we worked with samples a lot and we recorded vocals and edited them into different sounds. We also had a huge modular system. Szary and Sascha created a lot of sounds with it. I had to listen to a huge amount of sounds in the end and decide what to use. We created a lot of themes that way. What do you think about the current modular hype? I sneer at it a bit. I mean, I like the whole back-to-analog vibe. We can all agree on vinyl. But I think people are like, “I’m bored. I need a new tool in the studio to create music.” I think it’s better than software, because there’s hardly innovation there anymore. There are companies like Native [Instruments], who release an amazing thing once a year that makes you think, “Wow, nice.” And that’s it. But with modular systems you can constantly create new stuff. I think it’s entertainment. That’s all. Self-entertainment. Our last studio neighbor was a pretty famous DJ who was constantly touring the world, and he had a huge modular system. He spent all his money on that system. At one point he was stuck in that room playing on his modular, but he didn’t record anything. Do you think music making is getting more elitist because people have to pay for all of this gear? I don’t think so. People create their islands to get away from others. When we started making music, it was not so easy to create music. You had to get an actual sampler and stuff—a mixing desk. We still use these things. We don’t want to miss them. I think we use old and new stuff equally. I think it’s a sound source that the kids cannot really afford. Techno is all about distinction, about creating unique sounds. If you use a sample from a sample pack in a track, and someone recognizes it, you’re done. 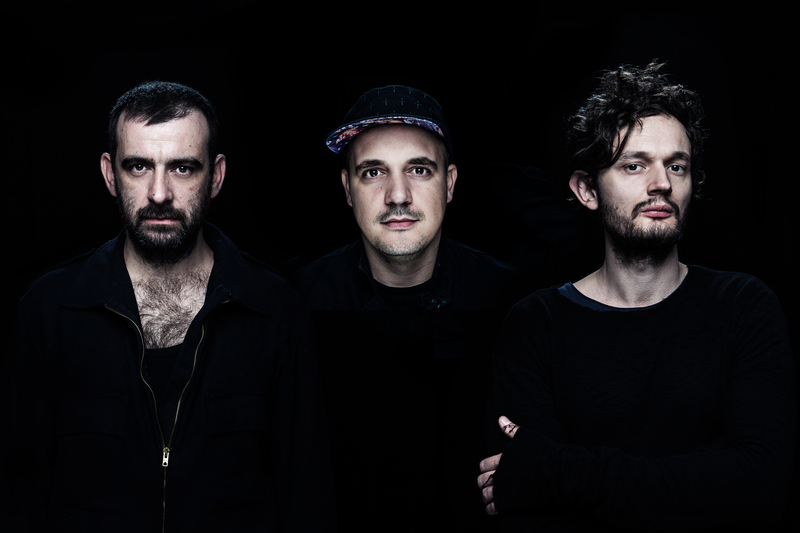 Moderat is getting bigger and bigger. What are your international plans? We have always been more internationally popular than we have been here in Germany. It’s just that we’re now getting the attention here that we already had in other countries. We started getting more attention in Germany after our last record. The key moment came when we played at Fête de la Musique in Berlin’s Mauerpark and an unbelievable amount of people showed up. We’d been on tour as Apparat and Modeselektor for 15 years before all of that happened. We never really played German cities, but we played hundreds of times in places like New York, Tokyo and Australia. So the question should be the other way around: It’s more interesting why we suddenly got more attention here. The USA is a special case. We had a solid base there. We had fans. But six or seven years ago, when EDM started, we lost interest because the whole electronic music world we knew just evaporated, and only now is it slowly starting to come back again. Why do you think Moderat is getting more mass appeal these days? I think Moderat makes the right music for it. Modeselektor and Apparat are too special to get broader recognition. One project is a bit more quiet, the other one is a bit louder. And with Moderat we kind of meet in the middle. How do you plan to work with that market? We licensed the album to Mute Records in the USA. We want to go the classic old-school way, and we don’t really want to play Las Vegas and the like. Honestly, we’ve been to the United States enough already, and we all have families now. Going there means a lot of traveling and hassles with taxes and stuff. Touring in Europe is entirely different, because you can just fly home when you get homesick. Cover photo by Flavien Prioreau.